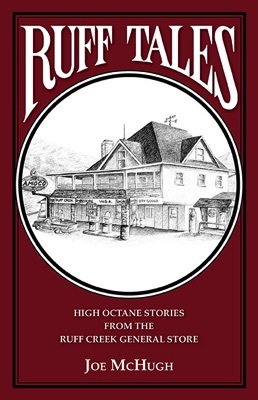 In Ruff Tales, High Octane Stories from the Ruff Creek General Store, storyteller Joe McHugh has gleaned the best of the homorous anecdotes, outlandish tall tales, and eerie ghost stories he has come across in his travels around the country in this delightful collection for young and old. In late November of 1985, Greene County experienced some disastrous flooding after several days and nights of drenching rain. Many of the creeks overflowed their banks and, in some places, the waters covered the roads, making travel impossible. The area around Ruff Creek was particularly hard hit. The general store lost a great deal of merchandise to water damage when its basement was flooded. Worst of all, the underground gas storage tanks were also ruined and had to be replaced at considerable cost. It was some time until the store was back to normal. "We were performing at a Christmas arts and crafts festival in Auburn, California one winter, and a woman saw our book Ruff Tales and told us a remarkable story of how she ran back into her burning house for her families favorite book, RUFF TALES! We gave her two free copies and said don't do that again."